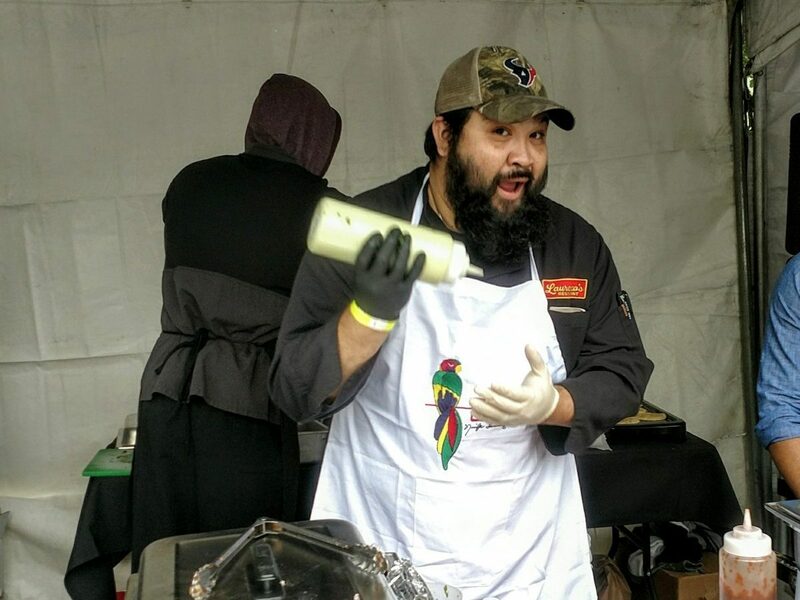 At the 2018 Tacos Over Texas competition, chef Donny Navarette gets ready to put the finishing touch on his tacos. Photo by Holly Beretto. Updated April 5, 2019, 12:09 p.m.: Due to concerns about storms over the weekend, Tacos Over Texas is rescheduled for Sunday, May 19, 2019. For those who have purchased tickets, these are still good for the new date. We’re awaiting further details on how ticketholders who can’t attend on the new date can request a refund. Below is a statement from the organizers. We have been following the weather closely and receiving updates from the City of Houston for Sunday, April 7. There is a 90% chance of rain with high winds, lightning and hail expected. The City of Houston has issued a high alert warning to employees to prepare for flooding and possible EOC activation. With all temporary structures, electricity and potential flooding, we need to consider the safety of our vendors and guests. That said, we have decided to reschedule Tacos Over Texas until May 19, 2019. 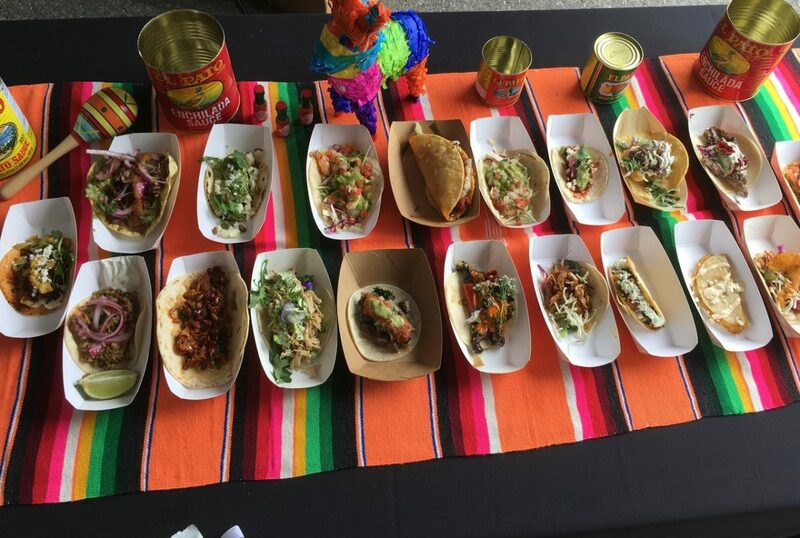 Last year was the inaugural Tacos Over Texas competition, and it’s coming back on April 7 May 19 from 1 to 4 p.m. at The Original Ninfa’s on Navigation. (The restaurant was recently honored as a James Beard Award semifinalist in the national Best Restaurant category.) Tickets are available online. General admission, which includes taco samples from the competitors, two drink tickets and access to the silent auction is $40. If those aren’t enough libations, VIPs get an open margarita and beer bar, early admission at noon and access to an exclusive seated area. Being a VIP is harder than it looks, as those tickets are $200 (but it’s for charity, y’all)! “Mama” Ninfa Laurenzo originally founded The Original Ninfa’s On Navigation in 1973. Even after she died in 2001, her influence on Houston’s restaurant industry lives on. Not only is her original establishment still around and successful (under Legacy Restaurants these days; it’s kind of a long story) but her heirs went on to form their own successful restaurants, El Tiempo (of which there are several locations) and Laurenzo’s. Selections of all the taco entries for 2018 Tacos Over Texas competition. Photo by Zaide Scheib. Is there a bit of rivalry between The Original Ninfa’s and El Tiempo? Well, that was inevitable, but through Tacos Over Texas, the two companies have harnessed it to do good. Mama Ninfa’s family members embraced the idea of a charity event and it raises money for the Ninfa Laurenzo Scholarship Fund. This year, the Tacos Over Texas honorary chairs are Johnny and Randi Carrabba and Tony and Phyllis Mandola, who are all members of Laurenzo’s immediate and extended family. The fund directly helps scholarship programs at Houston schools and universities. In 2018, Tacos Over Texas raised more than $100,000 and the organizers hope to beat that number this year. According to a press release, students from St. Pius X High School, Incarnate Word Academy, Cristo Rey Jesuit College Preparatory and the University of Houston received scholarships funded with proceeds raised by last year’s event. 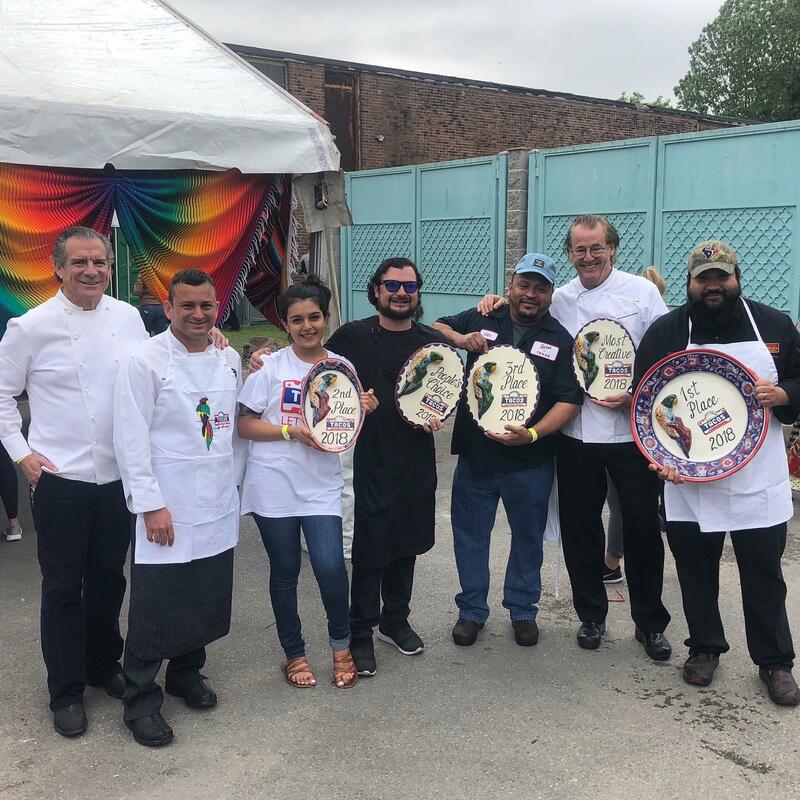 Chefs who attended and competed in the 2018 Tacos Over Texas included (from left to right) Michael Cordua, Dominic Laurenzo, Naomi Silva (holding Kiran’s second place prize), David Cordua, Alex Padilla, Robert Del Grande and Donny Navarette. Photo by Nick Scurfield. Here is the list of worthy competitors ready to bring their best taco games. New competitors for this year are noted below. Each restaurant is challenged to create a taco inspired by Mama Ninfa but still add unique and creative touches. Rick Heysquierdo, host of the Lone Star Jukebox show on KPFT 90.1 FM, is emceeing the event while Mariachi Emperadores de Mexico, Andrea Daniela and DJ Tony Styles provide the music. The Tacos Over Texas judges are Phaedra Cook of Houston Food Finder (that’s me), Annie Gallay of PaperCity, Cathy Hernandez of KPRC, Tim Malcolm of Houstonia, Greg Morago of the Houston Chronicle, Sam Ray of Goody Goody Liquor, Eric Sandler of CultureMap, Megha Tejpal of Houston CityBook and FoodNetwork.com, Marco Torres of the Houston Press and Lance Zierlein of ESPN 97.5 FM. Visit the Tacos Over Texas website for tickets and more information.